Ten of our most popular bit & barrel keys all on one ring. Tired of guessing which key to order? Have this ring on hand and never be without the right key. 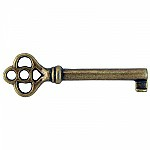 This antique skeleton key ring also contains a solid brass blank which can be hand filed to fit most any lock. 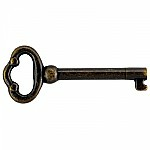 Shop around and you will find that our antique lock and key set is the most economical choice out there. The table below lists each key on the ring so that you can obtain all measurements and finishes. Keys are subject to availability and may be substituted. This item ships the same or next business day. This item is $10.56 when your order exceeds $250 before shipping in qualifying items. Bought this set in hopes that at least ONE of the keys would fit a tall secretary/bookcase I bought at auction. First tried some in the glass doors on the bookshelf on top. Yay, found a match! Then tried the same key on the roll top desk part - no luck, so tried a few more and YAY again, found another match. Then, tried both keys in the bottom drawers - no luck, but kept trying - and found ANOTHER match! 3 different keys needed for this ONE piece - and they were all on this ring!